Making steamed idlis at home has probably never been easier. With families growing increasingly nuclear, gone are the days of mastering the generations-old combination of rice, urad dal and fenugreek seeds to produce the perfect batter for soft, fluffy white idlis. All you now need to do is pick up a packet of ready-made idli batter from your local grocer or supermarket. But despite the high demand for ready-made idli batter—usually sold in transparent, unbranded polythene bags—the segment is a highly localised and fragmented one, with neighbourhood grocers being the usual stockists. Choice Stores, a 150-square feet grocer in Indiranagar, Bengaluru, was one such stockist. Although demand was high, the batter they sold—supplied by a local vendor—was not always predictable: On some days it didn’t taste as good, on others it was not available. Running Choice Stores were Abdul Nazer and his three younger brothers—one of the many families from neighbouring Kerala who run grocery stores in Bengaluru. Hanging out with them in the evenings and weekends was their cousin Musthafa PC, an IT professional who had returned to India after quitting his job with Citibank in Dubai, and taking up a position with Intel in India’s IT capital in 2003. When the cousins’ attempts at getting the vendor to fix the quality of the idli batter failed to work, a new idea began to germinate in their minds: “We thought, ‘Why don’t we fix the issue ourselves?’” says Musthafa, now 44. In 2006, Musthafa and his four cousins launched the iD brand of ready-made idli-dosa batter. Starting out as a one-product, one-city company, iD Fresh Food (India) Private Limited today manufactures and retails seven food products across 12 cities in India and in Dubai, generating revenues of about Rs 150 crore in fiscal 2016-17. The idli-dosa batter, however, remains their staple, bringing in 52 percent of earnings. With a use-by date of three to six days from the date of manufacture, the fresh batter can be first used to make idlis and then, after slight fermentation, to make dosas. The company has set up small-scale manufacturing facilities in Mumbai, Hyderabad, Chennai and Dubai to ensure that different geographies are supplied with freshly-made stocks. This February, Premji Invest, the family office of billionaire Azim Premji, bought an undisclosed minority stake in the company for $25 million (around Rs 160 crore), with the company having an option by which Premji Invest could put in an additional $5 million, if needed. This is the second round of funding raised by iD Fresh Food since raising Rs 35 crore from Helion Ventures in 2014. “The [Dubai] business is already about $5 million in revenue. And this is with only one product category (of parotas) and no advertising,” says Rahul Garg, partner and co-head, India PE, at Premji Invest. 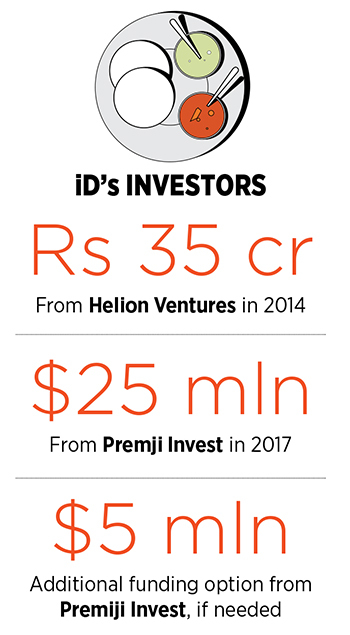 Although it has not been publicly stated by either party, Premji Invest’s funding valued iD Fresh Food at about $100 million. “It has already broken even and is not a loss-making company like many of the ecommerce companies. I always believe that old-economy businesses don’t burn money like [new-age] technology companies. If you have a great product, people will buy it,” says Garg. Given its small size, iD Fresh Food is not a typical Premji Invest target company. “We are keener on $40 million to $50 million deals. But with great companies, that too in the packaged food space, we are happy to come in early as well,” he explains. iD Fresh Food’s success might give the impression that it’s been a cake walk, but that’s hardly the case. In 2005, when Musthafa and his cousins set up their first kitchen—a 60 square feet space near their Choice Stores in Indiranagar—they had just scratched the surface of the complex world of idlis. Hailing from Kerala, the brothers were more familiar with appam, rather than idlis and dosas. (Commercially sold appam batter requires a certain amount of preservatives, which is against iD’s philosophy of offering 100 percent natural food products.) Consequently, they spent nearly six months and 3 tonnes of rice to perfect their idli-dosa batter mix. “We went through multiple combinations to find the right mix of rice and urad dal by talking to customers,” remembers Musthafa, CEO and co-founder of iD Fresh Food. (His four cousins hold the position of co-founders in the company.) Finally, they settled on a 1:4 proportion of dal to rice, with a 0.01 portion of fenugreek seeds. This wasn’t enough. A “specific” quality of rice and dal was required for this, he adds. This was followed by trial runs in about 20 neighbourhood grocery stores in Indiranagar. “In the beginning, we would supply 100 packets a day, five to each of the 20 stores, of which only 10 would get sold,” he says. By the end of 2006, however, they were selling at almost 200 grocery stores, and were outgrowing their 60 square feet kitchen. “We tried to create a brand out of an unbranded commodity,” says Musthafa. 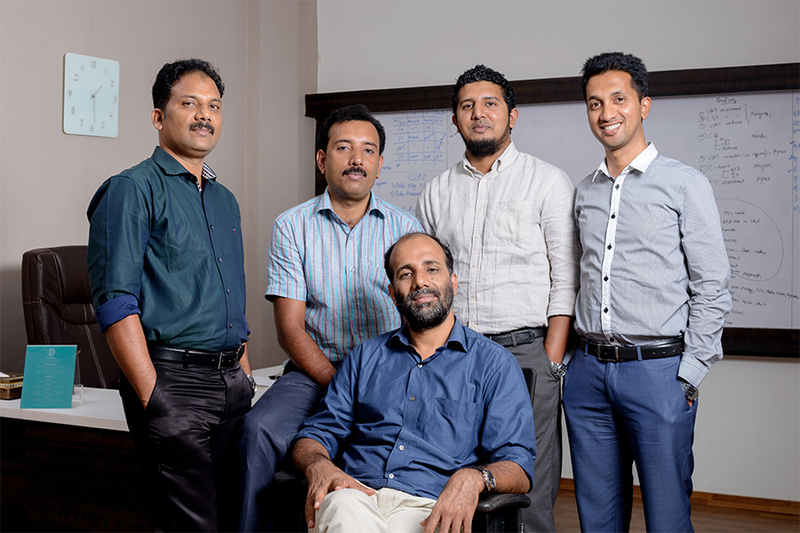 “Our packaging was strictly okay, but it was still the best in the market.” Branding apart, Musthafa and his cousins focussed on other factors—such as distribution and storage—to ensure their product maintained its quality; instead of going through the established distribution channels, iD Fresh Food set up its own distribution team. “We don’t know how they [distributors] would store our product,” says Musthafa. “And, for them, to drive growth they would put the product in each and every store, which would not be good for the brand.” Consequently, the iD brand of idli-dosa batter is sold only through stores that do not switch off their chillers or refrigerators at night, which amounts to about 6,000 of the city’s 65,000 retail outlets. What also worked in favour of iD was its social connections to the network of Malayali-run grocery stores in Bengaluru. “Going in for a strategy that is focussed on mom-and-pop stores is great, but it’s hard to execute. You need to break through the clutter,” says Hari Menon, CEO and co-founder of online grocery retailer BigBasket, which sells its own brand of idli-dosa batter. In 2006, Musthafa decided to set up a 900 square feet kitchen in CV Raman Nagar, an adjoining neighbourhood to Indiranagar. Dipping into his savings of Rs 15 lakh, he spent Rs 6 lakh on operationalising the new kitchen. “The idea was that we will produce 2,000 kg of batter per day from that kitchen,” he says. “To our surprise, by 2008, we ended up producing 3,500 kg of batter per day.” He then went on to set up a 2,500 square feet factory at Hoskote, on the outskirts of Bengaluru, in 2008. Given that iD churns out 55,000 kg of idli-dosa batter every day, the company has imported custom-made heavy duty wet grinding machines from Germany to cope with the scale of operations. If all this wasn’t enough to keep him busy, Musthafa completed a Post Graduate Programme in Enterprise Management from the Indian Institute of Management Bangalore in 2007 (he had quit his job at Intel in 2005), and by February 2008 became a full-time entrepreneur at Best Food Enterprises, which was rechristened iD Fresh Food (India) Private Limited in 2014. Now, with funds from Premji Invest, Musthafa plans to set up five factories—four in India and one in Dubai—that will manufacture idli-dosa batter, parotas, chapatis, paneer and curd. In the coming months the company expects to start selling vada batter, and ragi and millet dosa batter. “We experimented with other products such as appam batter and snacks like rose cookies, but they didn’t work out,” he adds. The fresh batter and ready-to-eat segment is the one in which iD Fresh Food is functioning. “We strongly believe in our product positioning, which is 100 percent natural and we deliver on it,” Musthafa says. For instance, he adds, iD’s paneer is made using the traditional method of adding lime instead of citric acid to milk, and they do not add baking soda to the idli-dosa batter to make it soft and fluffy. Innovation has also helped him keep a tab on his sales and distribution team. Musthafa has developed a mobile app through which he gets access to live sales updates at retail stores. “It has helped me predict demand at stores and that’s one of my USPs,” he says.